조선시대에 만들어진 커다란 백자 항아리로, 크기는 높이 49.0㎝, 아가리 지름 20.1㎝, 밑 지름 15.7㎝이다. 큰 항아리는 형태를 만들거나 구워내는데 어려움이 있기 때문에 한번에 물레로 만드는 경우는 거의 없고, 윗부분과 아랫부분을 따로 만든 후, 두 부분을 접합시켜 완성하는 것이 일반적이다. 짧은 아가리가 사선으로 작은 각을 이루며 맵시있게 꺾인 이 항아리는 아가리 주변 아래에서부터 목이 따로 없이 자연스러운 곡선을 그리면서 벌어지다가, 몸체 중앙의 접합부를 지나면서 다시 좁아져, 아가리 지름과 비슷한 크기의 굽에 이른다. 조선시대 백자의 특징인 온화한 백색과 유려한 곡선, 넉넉하고 꾸밈없는 형태를 고루 갖추어진 항아리로 백자호(국보 제261호)와 비교되는 대표적인 백자 항아리이다. 엷은 청색의 유약이 내외면에 고르게 씌워졌으며, 표면의 색조는 유백색이다. 이 항아리는 대형일 뿐 아니라 시원하고 당당한 모습이 17세기 말경부터 18세기 중엽 백자의 대표작이라 할 만 하다. 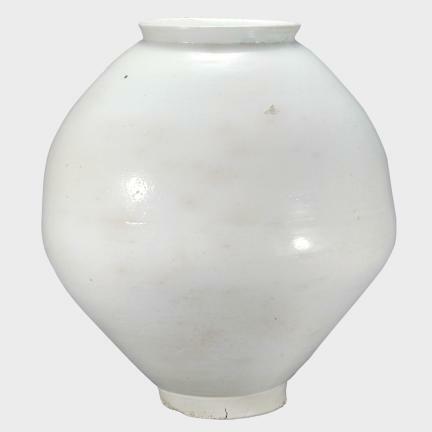 This is a large earthenware pot 49.0cm high, with a 20.1cm wide mouth, and 15.7cm wide base. Because of the difficulty associated with making such a large pot, it is a customary approach to make two separate parts and put them together later. The short lip of the opening is cut at an angle in a stylish manner. Below the opening, there is no neck and the bodyline widens starts to narrow down at the middle. This type of pot is called ‘Moon Earthenware Pot’. Its large size, the pleasant white colorimetric scheme, and its simplicity contribute to the name. Although, it has a different time origin, it is a representative Wonho, easily compared to the Ipho pottery (National Treasure No. 261). Pale blue glazing is on both the inside and outside surfaces, but the surface colorimetric is definitely white. There is an indication of where the top and bottom part of the pot are joined together. Along the bottom of the pot, there is a brown discoloration due to the impurities bonding the clay. Also, there are some scratches on the surface making the pot less clean. The modeling of round earthenware pottery is mostly found between the late seventeenth to the mid eighteenth century. Pots developed during this time period are highly represented by their large size and imposing shapes.